A little while ago, I had a strange experience. I was walking along one of the trails near my house in the suburbs northwest of Denver, Colorado, and I noticed that all the Allard’s ground crickets (Allonemobius allardi) were calling from the grass along the left side of the trail. I continued twenty paces, and it was the same: They were calling to my left, but not to my right. To my human eyes, conditions looked the same on either side on the trail: a sea of tall, brown, brittle grass—the way grass looks around here by late October. If I were a cricket, I reasoned, either side of the trail would be just as good. But I’m not a cricket. Neither am I a sandpiper. Re: not a sandpiper. Have you ever marveled at how two seemingly equivalent ponds, with apparently identical offerings of mudflats and midges, can host utterly different assemblages of sandpipers? One pond might be teeming with peeps, dowitchers, and phalaropes, while the other has nothing but a Killdeer, if that. And it’s not a one-off thing: Come back the next day, or even the next year, and it’s the same. One pond is feast, the other famine, consistently so. We humans, in our coarse and indiscriminate way, perceive generalized mudflats and midges. But the sandpipers—with their super-sensitive palates, fine-tuned motion sensors, and urgent metabolic needs—see, smell, hear, taste, and even feel things differently. There’s something about Putrid Pond that appeals to the sandpipers, and there’s something else about Stinky Seep that doesn’t appeal. Our human senses and “needs” just aren’t up to the task of distinguishing between the two offerings. I figured it had to be the same with the crickets. For whatever reason, they were singing from the left side of the trail. The grass all looked brown to me, but maybe the grass was, in some sense, “greener” on the left: more succulent, or perhaps a bit warmer, or maybe devoid of some competing or predatory species on the right. Or likely some complex function of those and other factors: higher food quality + warmer microclimate + fewer predators = crickets along the left side of the trail, but not the right. Crickets, like sandpipers, assess conditions in ways that we humans cannot. The trail ended, and I turned around. And, then, my strange experience turned really strange. All of a sudden, all the crickets were singing from the other side of the trail. It was like one of those experiments where you reverse the polarity of a magnet. I walked a couple paces, and it was the same: The crickets were still on the other side of the trail, t he complete opposite of where they had been a few minutes ago. An unhappy thought occurred to me. I did a 180°, and the crickets again “reversed polarity,” if you will. This wasn’t about the crickets. This was about me. The crickets were all around me, but I was hearing them only out of my left ear. My right ear couldn’t pick them up. A computer readout, below, of this cricket’s song enables us to “see” what we’re hearing. (Or not hearing, as the case might be.) The bottom panel plots the song as frequency in kHz (“kilohertz,” i.e., 1,000 hertz, or cycles per second) on the vertical axis vs. time in seconds on the horizontal axis. This cricket’s four-second song is right around 8 kHz, five octaves above middle C, or twice as high as the highest note on a piano. The top panel, the so-called “waveform function,” is more or less a measure of “loudness”—not a very precise term, I realize. Basically, if you’re right up against the ground cricket, it’s about 30 dB (“decibels”), equivalent to a quiet whisper in the library, distance 6 feet. Allard’s ground cricket (Allonemobius allardi). Boulder County, Colorado; Oct. 25, 2015; 3:57 pm MDT; 72° F.
Anyhow. They’re all high-pitched. They’re all quiet. And I’m experiencing some difficulty hearing them. It’s not that way with vision. A birder with corrective lenses isn’t stigmatized. Noah Strycker, birding’s reigning Young Turk, practically celebrated when he had LASIK surgery. And check this out: My Gen Z kids are always a bit glum when they come out of their annual eye exam and learn that they won’t need glasses for at least another twelve months. It’s been, like, a hundred years since young people were embarrassed to wear glasses. Same thing with other physical limitations. When we see a birder on crutches or in a wheelchair, we are inspired. And so we should be. I have a friend with fairly advanced muscular degeneration, a chronic and probably worsening condition, and she’s an active birder. Everybody admires her, and draws inspiration from her. But what if she wore hearing aids? 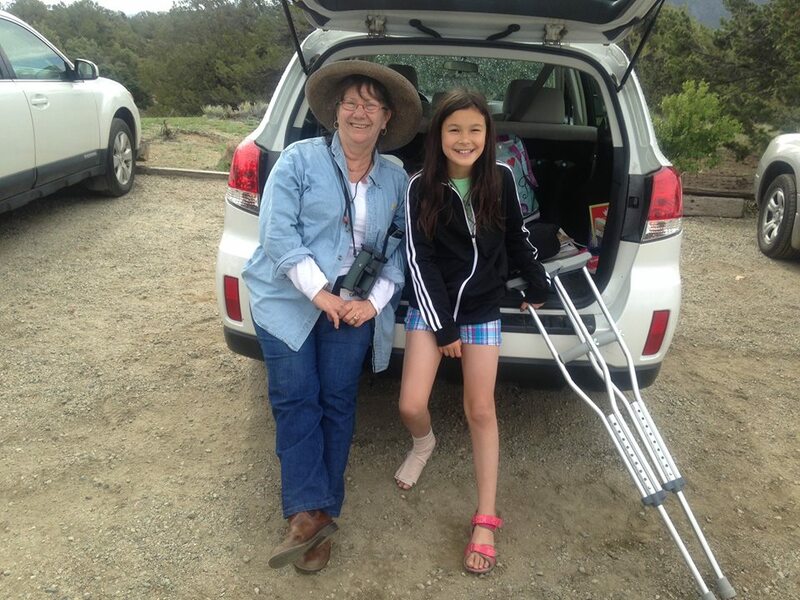 Cool birders Catherine Waters (left, corrective lenses) and Hannah Floyd (right, crutches). Chaffee County; Colorado; June 5, 2015. It’s weird. You can hobble around on crutches, or wear coke bottle glasses, or get puking sick on calm seas, and nobody will judge you for it. You can have an artificial knee installed, or elect for LASIK eye surgery, or wear a conspicuous Scopolamine patch, and you don’t lose any birding cred. But put in your hearing aids, and the murmuring and tsk-tsking instantly becomes as loud as a Screaming Piha or Horned Screamer. It’s weird, as I said, and it’s messed up. Aren’t hearing aids and corrective lenses, in essence, the same thing? Nobody with 20/200 vision would go birding without glasses or contacts. Yet many of us with comparable hearing loss forego hearing aids. 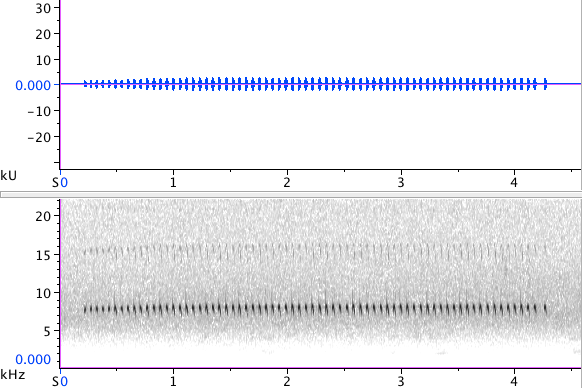 In Part 2 of this three-part post, we’ll take a look at hearing aids that really make a difference for birders. They’re not exactly cheap. But let’s put things in perspective: Depending on your insurance, they’re a fair bit less than LASIK surgery or a high-end scope-and-tripod rig. We’ll get there in tomorrow’s post. For now, though, I have a gentle suggestion: If you have a hang-up about hearing loss—and believe you me, I’m right there with you—see if you can put it aside for now.